Our YEP Jury have their say on Leeds United’s home clash with Birmingham City. Leeds United will look to bounce back from a mauling at Middlesbrough when they take on Birmingham City tomorrow at Elland Road. The defeat at Middlesbrough looks like a real drubbing on paper, but defensive howlers aside, the Whites were not that far behind the side who are hot favourites to return to the Premier League at the end of the season. However, if Leeds are to hold any ambition of joining in the promotion race, they must cut out the defensive calamities that have characterised the season so far. One way this can be done is to make sure that Guiseppe Bellusci is nowhere near the team, but he cannot be held solely responsible for the comedy masterclass that the Whites produced on Sunday. Had he had confidence in the goalkeeper behind him, there would have been no reason for him to intervene so disastrously, and once again despite his supreme shot stopping ability, the continuing presence of Marco Silvestri in goal has to be questioned. For all the goals he has prevented with stunning saves, this season at least there have been as many conceded by fundamental errors. Until he can prove that he is communicating effectively and commanding his penalty area, Leeds will continue to look shaky and be liable to commit errors. Whilst it is admirable that Uwe Rosler continues to stick by his young keeper, there has to be a limit on the number of errors he is allowed to commit, as the man upstairs is less likely to be as forgiving. In front of the back four there are a number of selection issues for Rosler to consider. At home does he stick with his favoured formation or does he try to take the game to a Birmingham side who have started the season very well? The fitness of Chris Wood will be key for Leeds as beyond him the Whites lack a real goalscoring threat as Mirco Antenucci, despite his hard work and undoubted skill, does not inspire a great deal of confidence that he can lead the attack. Leeds do have players now capable of supplying some ammunition to the front men and it will be interesting to see if Rosler will go for the X factor of Jordan Botaka over the proven talent of Will Buckley on the left hand side, with Stuart Dallas proving to be more effective on the right. I expect us to end our dismal home record with a win, albeit a nervy one. Prediction: Leeds United 2 Birmingham City 1. So already we’ve reached the 10th Championship fixture and 11th in all competitions, we stand where we finished last term, in mid table and the ‘jury’ is still out on how our season will pan out from here. I agree that the squad is better in terms of quality and youth but I sometimes wonder how it is utilised by Uwe Rosler. 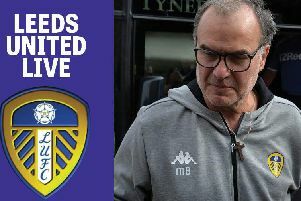 Tomorrow brings the visit of Birmingham City to Elland Road, led by Gary Rowell and they have surprised a few people by their good start, they sit in ninth place after the games played so far. Will Buckley should be signed as a ‘emergency loan’ today and is to stay at Leeds till into the new year, the acquisition of the player now gives Rosler the option of three genuine wingers and Sam Byram on the left or right of his favoured front three. It is hoped that Chris Wood has recovered to lead the front. Mirco Antenucci tried his best last weekend but even he will admit he’s not a typical number nine, he’s better playing just behind or alongside another striker. It’s the defence where the problem is, I just think the centre-backs are not consistently good enough. For me the partnership between Bamba and Cooper showed promise even though both players have a mistake in them. It’s a game Leeds should win, and I can see United just edging it. Birmingham arrive at Elland Road buoyed by their win at Brentford on Tuesday, a win that propelled them into the top six. They began the season well, like Leeds, unbeaten in their opening five league games. Then, again like Leeds, they lost their way, losing at home to Forest and Rotherham and going out of the Cup at Villa. As so often, Leeds are one defeat away from a crisis. Our propensity to lose games through defensive errors is a major concern, with few likely names waiting in the wings to replace the regular six we’ve relied on so far. If he’s fit, Cooper will surely resume in place of Bellusci who was very poor at Boro. My head says draw for this one but I’m going with my heart. Prediction: Leeds United 3 Birmingham City 2. The Blues have made a good start under Gary Rowett and following their midweek win at Brentford they now occupy a play-off place. After Middlesbrough, expect plenty of changes as United look to secure three points at LS11 for the first time this season. Birmingham will provide another tough test tomorrow but United have to win at home eventually and the pressure is heightened by Sunday’s capitulation. The starting line-up will be heavily anticipated and scrutinised. Will Chris Wood be fit? If Sam Byram doesn’t play again then who is calling the shots? If Giuseppe Bellusci starts then who has Liam Cooper been upsetting? And, finally, how do you fit Buckley, Botaka and Dallas into the same team? Uwe Rosler has all of these problems to resolve but, if he does so successfully, a home win should be more than possible. We’re at a pivotal point where the direction that our performances and results swing now will set the tone for the rest of the season. Prediction: Leeds United 2 Birmingham City 0. We need a really strong performance tomorrow because Birmingham will be no pushovers. I’m confident we will bounce back from last week’s defeat. A few changes need to be made especially at the back and I think we will be a lot more attacking. Prediction: Leeds United 3 Birmingham City 1.